Company name: Mobile Air Pte. Ltd.
Re: Mobile Air Pte. Ltd.
A Stomper sent in video footage showing the Vietnamese tourist kneeling down and begging for his refund at the Sim Lim Square shop making headlines recently, Mobile Air. The tourist, who earns $200 a month as a factory worker in Vietnam, was asked to pay an additional $1,500 for a warranty package on top of a payment of $950 which he had already made for an iPhone 6. He had intended to purchase the mobile phone for his girlfriend as her birthday present. In the video, a man, presumably the shopkeeper, is heard asking the tourist how he is "going to settle (his) money". In tears, the tourist said, "I don't know. I borrowed (from) my friend, so I want to give (it) back to my friend, you know?" He then bowed his head to the ground, looking helplessly around. He did this twice before standing up. "Here is the video of the Vietnamese tourist kneeling down and begging at the shop. "I hope you can post it on Stomp to show people what Mobile Air is doing to tourists." Mobile Air has spurred the outrage of netizens previously with news of the shop refunding another tourist, a female Chinese national, $1,010 in 5 and 10-cent coins. The internet is also currently abuzz with stories of scam cases in Sim Lim Square, with The High Court of Singapore granting a permanent injunction against another shop there, Cyber Maestro Pte Ltd, prohibiting its employees and agents from engaging in several unfair practices under the Consumer Protection (Fair Trading) Act. The Consumers Association of Singapore (CASE) would like to inform the public that Mobile Air Pte Ltd has declined to sign our Voluntary Compliance Agreement (VCA) and pledge to stop their unfair practices. As such, we have decided to take out an injunction against this company. 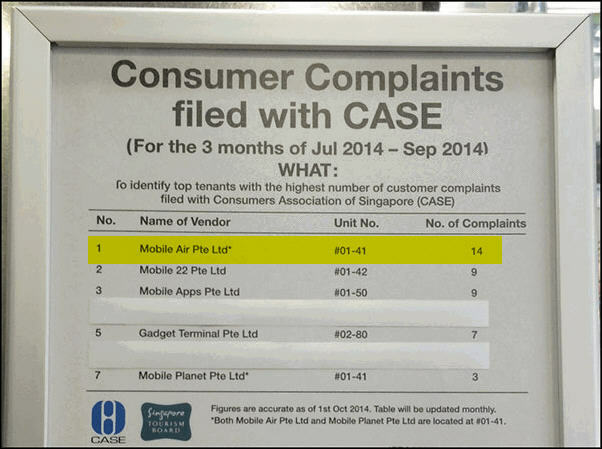 If the injunction is granted by the Court of Singapore, Mobile Air Pte Ltd will be restricted from engaging in unfair practices as stated in the Consumer Protection (Fair Trading) Act (CPFTA). In order to take injunction action against the company, CASE would need to seek the necessary approval from our relevant committees as well as the Injunction Proposals Review Panel at the Ministry of Trade and Industry (MTI) and then apply to the Court for the injunction. The entire process may take several months. CASE is committed to protecting consumers’ interests and we will crack down strongly against errant traders whom have refused to stop their unfair practices despite repeated warnings. I was a former staff working in Mobile Air and I would like to leak this video that was taken a few weeks ago. From this video you can see that Mr Jover Chew and his scam partner are attempting to scam a tourist from India by intimidating him by saying that he is on camera as well telling him that once his card is swiped no refund can be given. This is actually not true, full refund can be given easily. I felt really guilty working there. Please keep my identity confidential. I have more to share. For those of you saying that the people working there are gangster, you are actually not wrong. They are actual gangsters and some of them still have backings which is why I am very afraid to come forward with this video. However, I trust that my identity will be kept confidential by you guys at TRS. You guys must be thinking Sim lim Square got so many store, why would tourists so stupid by keep getting scam at Mobile Air despite CASE blacklisting them on the first floor of Sim Lim Square right? Actually the tourists are not stupid, they are just hooked on the fact that the mobile phones being sold at Mobile Air is the cheapest. It is actually below market price and they are actually making a lost if they sell it to the tourists without scamming them. Most tourists are actually smart shoppers, they will compare all the prices at Sim Lim Square before coming back to Mobile Air to purchase their product. When tourists get hooked, they will then take the tourist credit card and make them make payment. They will also ask them to sign a contract which says that they want to include a 1 year warranty. They will purposely cover the part that says that the warranty cost an extra $1,000 for 1 year with their fingers and most tourists will just blindly sign it. Once they sign the contract, they immediately deduct $1,000 + the price of the mobile phone from their credit card and then reveal to them that the warranty cost an extra $1,000. Most tourists are also not pushover, once they realize they have been scammed, they would demand for a refund. This is where their gangster tactics come in, they will start behaving like a gangster and being aggressive towards the customer. They even lied to the tourists that they will call the police if they still continue asking for refund. They will also tell them that they are recorded on camera and then scare them away. I would say 80% of the tourists will just count themselves unlucky and just walk away with the phone. I have more to share with you guys if you all want. Actually, a lot other businesses in Sim Lim Square operates like that also. Definitely not all, but maybe 20% of the stores are like that. There are also decent businesses around of course. SINGAPORE – Jover Chew, the owner of now-defunct Mobile Air, and four other men were arrested on Wednesday for a series of cheating cases at Sim Lim Square. The five men arrested were between 31 and 38 years old. The police said they had received several reports against Mobile Air in 2014 for dishonest sales practices in which customers were coerced into buying mobile phones and in-house warranties at inflated prices. These victims ended up paying for the mobile phones at much higher prices or had to pay fees to cancel the deal. Chew, 32, and his shop became infamous after videos were posted last November of a crying Vietnamese tourist begging staff at the shop to refund his money. Factory worker Pham Van Thoai went to Mobile Air to buy an iPhone 6 for his girlfriend in November 2013. At first, he was told that he had to pay $950, but another charge of $1,500 for a warranty was added. Mr Thoai was told that if he failed to pay the additional amount, he would not only lose the $950 but also the new phone. He knelt down, pleading with Chew to return his money. After the video went viral, online vigilantes posted Chew's personal details online, driving him out of the mall. A crowdfunding campaign was initiated to raised funds to buy a new phone for Mr Thoai. About $15,500 was raised, with $1,538 used to buy an iPhone 6 for Mr Thoai. But he declined the gift, accepting only about $200 worth of food items from Singapore. SINGAPORE - Jover Chew Chiew Loon, the owner of Mobile Air, was bailed on Friday afternoon after being charged in court earlier in the day with cheating a total of 25 victims at his now-defunct Sim Lim Square shop. He walked out of the State Courts at around 3.45pm, after his mother posted $40,000 bail. Chew was charged on 25 counts of cheating involving a total of $14,449 and one count of criminal intimidation for threatening to cause a victim's work permit to be revoked. The 33-year-old and four other men were arrested by police on Wednesday. The four were also charged yesterday, and faced between one to 15 counts of cheating. Chew, who was represented by lawyer Chia Kok Seng, did not enter a plea. Mr Chia asked for time to take instructions from his client, and a pre-trial conference has been fixed for June 25. Among his accomplices, Koh Guan Seng, 38, was charged with 15 counts of cheating involving $9,789. Kam Kok Keong, 31, faces 8 charges of cheating involving $3,710. Edmund Lim Hong Ching, 33, faces two counts of cheating involving $1,600. Kelvin Lim Zhi Wei, 32, was charged with one count of cheating involving $330. The four men were all unrepresented. They indicated to the court that they would be pleading guilty at a later date. Their case will be heard again on June 19. Several police reports were lodged in 2014 against Mobile Air for dishonest sales practices. Customers said they were coerced into buying mobile phones and in-house warranties at inflated prices. "These victims ended up paying for the hand phones at much higher prices or had to pay fees to cancel the deal," said the police on Wednesday, the day the five men were arrested. Earlier on Friday morning, Chew, Koh and Kam arrived at the State Courts at around 7.30am in a police van. A crowdfunding campaign was initiated to raise funds to buy a new phone for Mr Thoai. About $15,500 was raised, with $1,538 used to buy an iPhone for him. But Mr Thoai declined the gift, accepting only about $200 worth of food items from Singaporeans. Both victims are not among the 25 victims named in the charges on Friday morning. Chinese evening newspaper Lianhe Wanbao reported on Thursday that Chew has been unemployed for the past five months, and occasionally helps out at his mother's hawker stall. Shin Min Daily News reported that Chew was having breakfast with his mother on Wednesday when he received a call to report to the police at 3pm. He then told her that he would have to stay at the police station for 48 hours, and would be charged in court on Friday morning. "He and the others have been asked to assist with investigations many times in the past half year," Madam Chew was quoted by Shin Min as saying. Both Madam Chew and her son declined to comment when approached on Friday afternoon. For each of their cheating offences, Chew and his accomplices face up to 10 years in jail and a fine. For criminal intimidation, Chew faces up to two years's jail, a fine or both. SINGAPORE — Two fresh charges have been brought against Jover Chew, the former owner of Sim Lim Square electronics shop Mobile Air, bringing the total number of charges to 28. These charges were read during a pre-trial conference today (July 30). Chew allegedly exhibited insulting behaviour and caused distress to a customer, Ms Zou Jing Tong, in October last year. Ms Zou had to pick up small change amounting to S$547 after Chew scattered it on the floor of his shop. The amount owed to Ms Zou was part of a Small Claims Tribunal order. For this, he could be fined up to S$5,000. Chew, 33, is also accused of conspiring with ex-employee Kam Kok Keong to cheat walk-in customers between Dec 2013 and Sept 24 last year. On Sept 24 last year, Kam tricked Ms Zou into believing that she could buy an iPhone 6 Plus at S$1,600 - a fact which Kam knew to be false. As such, he received S$1,600 dishonestly, abetted by Chew. If convicted, Chew could be jailed up to 10 years and fined. For the incident involving Ms Zou, Kam, 31, now also faces another charge for conspiring with Chew and abetting him. In total, he faces nine charges. Three other employees — Koh Guan Seng, 38, Lim Hong Ching, 33, and Lim Zhi Wei Kelvin, 32 — have also been charged. They face one to 15 charges each of abetment by conspiracy to commit cheating. All five men are out in bail. Mobile Air became notorious after a video of a tourist, Mr Pham Van Thoai, going on his knees to beg for a refund at the shop went viral. The Vietnamese had paid S$950 for an iPhone 6, but was told he had to add S$1,500 in warranty fees. SINGAPORE: Four former employees of now-defunct Sim Lim square electronics shop Mobile Air pleaded guilty on Thursday (Oct 1) morning and were convicted on 13 counts of cheating. Koh Guan Seng, 38, Kam Kok Keong, 31, Kelvin Lim Zhi Wei, 32, and Lim Hong Ching, 34, had been employed by Jover Chew Chiew Loon as freelance sales executives in 2013 and 2014. Chew devised a ‘sales modus operandi’, which he taught to the four men, to cheat unsuspecting customers of Mobile Air. The men would receive a 40% of commission of the profits made from their sales. Together, the four accomplices cheated customers of almost S$16,149 by unscrupulous sales tactics. For example, Kelvin Lim pressured a customer, a Bangladeshi national working as a construction worker in Singapore, to sign a blank invoice. The foursome would also add additional items to invoices after they had been signed by customers, and refuse to hand over the purchased products until additional payments had been made. Chew controlled the pricing of all mobile devices at Mobile Air, and instructed his salesmen to sell the devices at prices higher than what he would indicate on the packaging. Chew would indicate this ‘price to beat’ on the packaging of each device by using the letters in the world ‘S-I-N-G-A-P-O-R-E’ to represent the digits ‘1’ to ‘9’, and any other letter to represent zero. For example, S$1,148 would be represented by the letters ‘SSGR’. Salesmen who sold the devices at a lesser price than indicated by Chew would be personally liable for the difference. Mobile Air’s standard practice was to offer customers an attractive price for devices, and collect full payment from customers straight away. However, upon receiving full payment, the customer, instead of receiving the device, would be confronted with various sales tactics. Salesmen would add additional items to invoices previously signed by customers upon agreement on the initial sale prices. The men would then withhold the devices and demand further payment. This method of collecting payment in two stages, and not stating any additional payment when negotiating the initial prices, was used to cheat at least 25 victims. Deputy Public Prosecutors Eunice Lim, Charis Low and Victoria Ting called this “a brazen case of cheating”, noting that even the involvement of the police and the Consumers Association of Singapore (CASE) and the Small Claims Tribunal (SCT) did not deter nor limit the four accused’s resolve to cheat customers. Many of the victims were low-wage workers, with limited understanding of the English language and consumer rights. The salesmen, in several instances, also demanded victims to hand over their ATM cards and threatened to call the victims’ employers and have their work permits revoked. Kam even accompanied a victim to an ATM machine to check his balance. When the victim returned to the shop, Kelvin Lim demanded the victim's ATM card and emptied the account, leaving the victim with a balance of just S$7. The men faced between one and six charges of cheating each, for which they could be punished with up to 10 years’ jail and a fine. DPPs Lim, Low and Ting are seeking imprisonment terms of between at least five and 18 months’ jail for the quartet. The men are expected to be sentenced on Oct 14. Chew is expected to plead guilty on Oct 28. He is facing a total of 28 charges. SINGAPORE: Four former employees of the now-defunct Sim Lim square electronics shop Mobile Air were sentenced on Wednesday (Oct 14) to between four and fourteen months jail for cheating. Koh Guan Seng, 38, was sentenced to 14 months jail, Kam Kok Keong, 31, was sentenced to 11 months' jail, Kelvin Lim Zhi Wei, 32, was sentenced to four months' jail, and Lim Hong Ching, 34, was sentenced to six months' jail. The four had been employed by Jover Chew Chiew Loon as freelance sales executives in 2013 and 2014. Chew devised a sales modus operandi - which he taught the four men - to cheat unsuspecting customers of Mobile Air. The men would receive a 40 per cent commission of the profits made from their sales. Together, the four accomplices cheated customers of about S$16,149 using unscrupulous sales tactics, the court heard. For example, Kelvin Lim (above) pressured a customer, a Bangladeshi national working as a construction worker in Singapore, to sign a blank invoice. Kam (below) accompanied another victim to an ATM machine to check his balance. When the victim returned to the shop, Kelvin Lim demanded the victim's ATM card and emptied the account, leaving the victim with a balance of just S$7, the court heard. The four would also add additional items to invoices after they had been signed by customers, and refuse to hand over the purchased products until additional payments had been made. The salesmen were ordered to sell devices at prices higher than what Chew indicated on the packaging. Chew would indicate this "price to beat" on the packaging of each device by using the letters in the word S-I-N-G-A-P-O-R-E to represent the digits 1 to 9, respectively, and any other letter to represent zero. For example, S$1,148 would be represented by the letters "SSGR". Salesmen who sold the devices at a lower price than indicated by Chew would be personally liable for the difference, the court heard. The four salesmen would add additional items to invoices previously signed by customers upon agreement on the initial sale prices. The men would then withhold the devices and demand further payment. This method of collecting payment in two stages, and not stating any additional payment when negotiating the initial prices, was used to cheat at least 25 victims. During the hearing on Wednesday, Deputy Public Prosecutor (DPP) Eunice Lim urged the court to issue a stiff sentence to show its disapproval, and to deter like-minded perpetrators. "Many consumers made enquiries with other shops but chose to conduct business with Mobile Air, based on attractive prices which we now know to be a scam," said DPP Lim. She added that the prosecution did not pursue compensation order because restitution had been made to the victims by Jover Chew, which amounted to S$11,699. "But it should be noted that the four co-accused here today have not made any restitution," said DPP Lim. District Judge Toh Yung Cheong, before delivering their sentence, said: "I agree with the prosecution on the harm to the victims, and the harm caused to the reputation of Singapore as a tourist destination." "As for their individual culpability, I looked at each case individually. While I noted that they were employed by Jover Chew and that it was the latter who gave them instructions on what to do, the accused persons were the ones who made the conscious decision to commit the offences," said Judge Toh. "In committing the offences, they behaved like thugs rather than sales assistants and they must bear personal responsibility for their conduct." In total, the four were charged with 27 offences of abetment to cheat, and were convicted for 13. Koh Guan Seng was charged with 15 counts, and the prosecution proceeded with six. Kam Kok Keong, was charged with nine counts, and was convicted for four of them. Kelvin Lim was convicted the on one count which he was charged for, and Lim Hong Ching was convicted on the two counts which he was charged for. Referring to Koh and Kam's number of charges, Judge Toh said that this "showed their commitment to the criminal enterprise which did not waver despite the police being called in, the involvement of the Consumer's Association, and even after being shown an order from the Small Claims Tribunal". "Therefore I found Koh and Kam to be more culpable than Lim Hong Ching and Lim Zhi Wei Kelvin who faced fewer charges." Chew is expected to plead guilty on Oct 28. He faces a total of 28 charges. Chew, 33, pleaded guilty earlier to cheating 26 victims out of S$16,599 over a period of 10 months. SINGAPORE: Jover Chew, the owner of now-defunct mobile phone shop Mobile Air, was sentenced to 33 months' jail and a fine of S$2,000 on Monday (Nov 30) for cheating 26 victims out of S$16,599 over a period of 10 months. On Nov 16, Chew, 33, pleaded guilty to 12 charges of cheating which took place between January and October 2014. Another 16 charges were taken into consideration for sentencing. Ten out of the 12 proceeded charges were for cheating offences, while the remaining two were for criminal intimidation and intentional distress. In November 2014, a video of a Vietnamese tourist begging Chew for a refund went viral. Mr Pham Van Thoai - a factory worker who made about S$200 monthly - paid S$950 for an iPhone 6 at Mobile Air, but was told he could only get the phone if he paid an additional warranty fee of S$1,500. Chew and his employees also made another customer pick up S$1,010 in coins off his shop floor. The amount was what the Small Claims Tribunal had ordered Mobile Air to refund the customer after the shop overcharged on the price of an iPhone 6 Plus. Four of Chew’s former employees have been handed jail terms of between four and 14 months. In a hearing earlier this month, Chew’s lawyer told the court that his client was undergoing treatment for depression. Chew’s wife had also initiated divorce proceedings, his lawyer added. Chew was also taking care of his parents and servicing massive debts incurred by his elder brother, the court heard. He wanted to buy an iPad Air and decided to visit Sim Lim Square. After all, he had frequented the mall previously and bought a drawing tab and piano accessories without any problems. But his decision to visit Mobile Air turned out to be one he still regrets after he was cheated of over $400 by its employees. Adam (not his real name), who is from a neighbouring South-east Asian country, was one of the 26 customers fleeced by the shop's then owner, Jover Chew, and his staff members. Chew, 33, was jailed 33 months and fined $2,000 yesterday. He had pleaded guilty last month to 10 counts of cheating, one count of criminal intimidation and one count of causing distress. Adam, who has been working in Singapore for five years and declined to give his real name for fear of reprisals, recounted to The New Paper his harrowing experience when he visited Sim Lim Square sometime between April and August last year. He walked into Mobile Air, which has since closed down, to buy an iPad Air and was quoted a price of about $450. "I trusted the shop because I had full trust that Singapore shopkeepers were running honest businesses," he said. But after paying up, the Mobile Air staff demanded $900 more. That was when Adam knew something was wrong and called the police. He said: "They (the staff members) acted smug and confident that they could convince the police. And they did." Adam said the police officers just told him to contact the Consumers Association of Singapore. He did not get back the money that he paid to the shop. Said Adam: "I have no one here to back me up - my family, friends are not here. I'm sure this is why they target low-wage foreign workers like me. "I felt weak and helpless." It was a point noted yesterday by District Judge Siva Shanmugam, who said most of Chew's victims were foreigners and were unlikely to assert their rights here. Judge Siva also said the offences had an adverse effect on Singapore's efforts to promote itself as a retail hub with both the local and foreign media highlighting the need for caution on the part of customers when dealing with errant local retailers. Said Adam: "The experience definitely left an indelible mark on how I purchase items. No, I won't go back (to Sim Lim Square), or to any shop that looks cheap and dubious." Adam said he had no opinion on Chew's sentence and how the court delivered judgment. He said: "I only wish those victimised will learn from it. "I love Singapore and hold the Government and law enforcement in very high regard. "I know a lot of Singaporeans are doing their part to keep the country safe for everyone." District Judge Siva Shanmugam said yesterday that Jover Chew Chiew Loon had set up Mobile Air to cheat unsuspecting customers, and the 26 cheating charges showed his persistence in doing so. The judge added that Chew had used a variety of dishonest means and "remained unperturbed by letters from the Consumers Association of Singapore (Case) and a default order from the Small Claims Tribunal". He sentenced Chew, 33, to 33 months' jail and fined him $2,000 for 10 counts of cheating, one count of criminal intimidation and another of using insulting behaviour on a customer. Another 16 cheating charges were taken into consideration for sentencing. His four accomplices - Koh Guan Seng, Kam Kok Keong, Lim Hong Ching and Kelvin Lim Zhi Wei - were jailed between four and 14 months each in October. Court papers said that after setting up Mobile Air in October 2013, Chew had masterminded a scheme to lure unsuspecting customers to his Sim Lim Square shop by offering mobile devices at low prices. He also taught his sales team a set of tricks they could use to con customers, including bullying tactics to force sales and inflating prices with exorbitant add-ons. 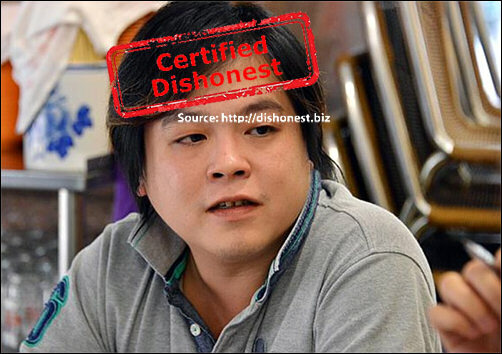 Between January and October last year, Chew and his accomplices cheated 26 customers of $12,199. Chew actively managed Mobile Air and earned 60 per cent commission on profits from mobile phone sales. The shop first made headlines last October after giving a customer $547 in coins as part of a $1,010 refund ordered by the Small Claims Tribunal. It was in the spotlight again the following month after a video clip of a Vietnamese tourist kneeling in his shop and begging for a refund went viral. Chew has since returned all $12,199 due to his 26 victims. His mother, who was in court, was seen sobbing and hugging her son after the proceedings. Last December, customers gathered outside Volks Auto in MacPherson Road, looking for the owner. The firm had collected over $3.6 million from more than 100 buyers without delivering the cars. Police later confirmed that the owner had left Singapore in early December that year. An employee of a car dealership, which shut its doors after allegedly collecting over $3.6 million from more than 100 buyers without delivering the cars, was charged with abetment to cheat yesterday. Koh Chek Seng, 33, did not enter a plea to his single charge of conspiring with Volks Auto owner Alvin Loo Mun Yu and another man, Jason Koh Chi Kang, to deceive a customer into believing that the company was able to import and deliver a Toyota Harrier 2.0, thereby dishonestly inducing the victim to pay a $25,500 deposit on July 10 last year. Koh was remanded for another week at Bedok Police Division to assist in the probe. District Judge Eddy Tham granted the prosecution's application to allow Koh to be taken out for investigations. The police prosecutor told the court that Koh is believed to have been involved in similar cases of non-delivery of cars and could face more charges at a later date. Volks Auto made the news a year ago after disgruntled customers gathered outside the parallel importer in MacPherson Road to look for Loo. Some customers also contacted the media to highlight their plight. Parallel importers such as Volks Auto purchase cars from dealers overseas and sell them in the local market for a profit, typically at prices lower than those charged by authorised dealers. Police later confirmed that Loo left Singapore in early December last year, before customers discovered his business was closed. Koh's case will be heard again next Wednesday. If convicted of his cheating charge, he faces up to 10 years in jail and a fine.